If you're looking for ways to spice up your toes this season, look no further than these pictures of toenail designs! From simple and sophisticated to fun and fantastical, there are hundreds of ways to add a little sparkle to your toenails. Have some fun with bright colors for summer with bold, colorful polka dots against a hot pink background. This retro-inspired look can be done freehand for a unique, casual feel. For a special occasion, a unique metallic design is bold yet elegant. 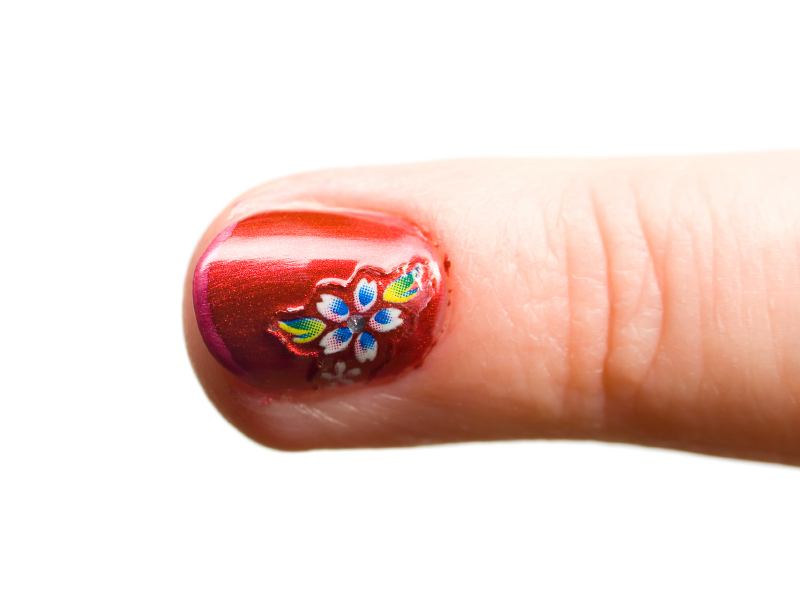 An experienced nail artist can create designs inspired from your favorite jewelry or other items for a truly one-of-a-kind look in your toenail design. Horizontal black squiggle stripes create a fun and funky toe nail look against white polish, and glitter makes the design really sparkle. For an easy-to-create toe nail design, use an eye-catching polish color and place a small decal in the center of each toe. One of the hottest trends in nails and toenail designs is the animal print. This can be done in a variety of ways, from a subtle tiger stripe to a bold color and leopard spots as shown in this design. Rich, vibrant colors are featured in this gently swirling striped design. While the design itself is playful, paired with an elegant shoe it still looks sophisticated. If you have an affinity for a special symbol, like these Chinese characters for good luck, a nail artist can turn what's closest to your heart into a stunning nail design. For a look that's pretty and polished, choose coordinating toe and nail designs. White toenail tips look fresh and work with virtually any nail art. Bright colors, tropical flowers, and pretty seascapes are perfect for summer beach-inspired toenail designs. If you liked these pictures of toenail designs, check out our beachy nail designs slideshow.